Order Now... SHIPS TOMORROW with FREE SHIPPING! Sign Up For Deals Email Opt Out Forgot Your Password? Do You Charge Sales Tax? Do You Match Prices? Order Status My Account Order History Return/Exchange Item Forgot Your Password? Bowling.com Coupons Free Shipping Details Do You Charge Sales Tax? Shipping Questions Do You Match Prices? Need More Help? We'd like to offer you $5 off your purchase of $50 or more today! Coupon excludes instant bonus items, hot deal items, and gift certificates. Your Coupon Has Been Applied to Your Cart. Enjoy Shopping! Accept or decline drilling protection. THIS ITEM WILL SHIP IN 1-2 WEEKS. WE CANNOT SHIP THIS ITEM OUTSIDE OF THE UNITED STATES. 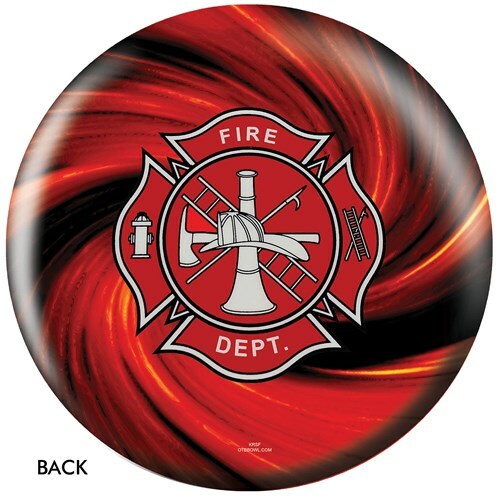 This ball is recommended for any lane condition and would make a great gift for anyone who likes the Fire Department! This ball may have a seam where both halves meet. Be the First to Review It! Thanks for asking your question! Once approved by our staff it will be posted here for others to answer. If you'd like to receive answers to your question via email enter your email address below. Want Specials in Your Email? Give me the emails! I don't want to miss out on personalized emails that use my shopping/order history, or the latest sales and exclusive deals from Bowling.com. Thanks for answering another customer's question! Once approved it will be posted here. Due to the time it takes to produce the OnTheBallBowling Fire Dept Red ball it will ship in 1-2 weeks. We cannot ship this ball outside the United States. We accept all major credit cards & PayPal. ©1999-2019 bowling.com, Inc. All rights reserved. bowling.com is a trademark of bowling.com, Inc.